If you have ever eaten a fresh olive, you haven’t forgotten the experience. In fact you may still be prying your puckered lips apart. Things are bitter like you wouldn’t believe. Make aspirin taste like aspartame. Which is why every other olive you’ll ever eat will have been cured: curing eliminates the bitter compounds. It’s done in three general ways. Green, unripe olives, often called simply French or Spanish, usually get brined in saltwater. Purplish, half-ripe olives, Kalamatas being the best known, are soaked in wine or wine vinegar. 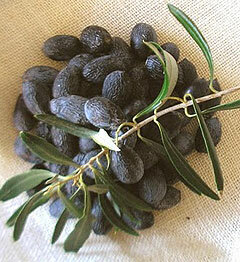 And fully ripened black olives, often marketed as Moroccan or oil-cured, are packed in barrels of salt. Throubes olives go a very different route. They’re allowed to ripen on the trees — and then they’re left there to dry and shrivel like raisins. Instead of by some sort of chemical mojo, they’re cured by the sun and the wind. Then they’re given a light salting and sent to market. Nothing’s added to muddy their flavor, and so their flavor is like no other olive: rich, earthy, fat in the mouth. If you can somehow imagine great virgin olive oil with a background Champagne dryness, you’re there. But it’s probably easier to just find and eat some. Because production is seasonal, and because they’re only produced in a few areas of Greece, they’re not always available. But they’ve been showing up at my local Greek market for a few weeks, and I’d guess gourmet shops are carrying them this month, too. Worth seeking out. And worth trying in a martini this weekend while the steaks are grilling. It’s heresy, I know, but I can’t stand green olives in a martini. To me, you might as well be drinking seawater. A Throubes olive, though, imparts only the better angels of its nature. It also looks pretty damn cool.